Xcalibre Paintball shared a post. "the 5th Annual Play 4 Daye Bash 4 Nash tournament to take place on June 8, 2019. Youth residing within the Regional Municipality of Wood Buffalo can also apply for a scholarship by forwarding their application letter by e-mail to dayenashmemorialfoundation@gmail.com by May 17, 2019. Four scholarship recipients are chosen by the board each Spring and individuals can apply themselves or can be recommended by coaches, parents, teachers or a mentor." Also featured on page 20 this month is our Community Building Blocks feature (scroll over the photo with the snapd HUB app to hear more of the story), as well as the Fort McMurray Oilsands Curling Club Bonspiel. 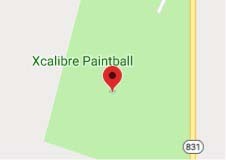 Xcalibre Paintball updated their cover photo. Slide straight in from street to field in our Free Motion Jeans! Denim + ballistic knees = epic win. We have two pairs of these babies up for grabs. Xcalibre Paintball shared a photo. The Eclipse PAL Upgrade Programme is now LIVE! Hi everyone, this Sunday is our “Zombie” Paintball game. We have a fresh batch of GI paint in (we also have winter blend, just in case). Registration from 9:00-10:30, game starts at 11:00. Lunch concession available. Hope to see you there! Xcalibre Paintball shared an album. Big thanks to Andrew Tenove for his help creating our 2018 scenario events plus building our props for this season, to our teams Xcalibre Reign, Xcalibre Reign 2 and the Devils Rejects for donating prizes and joining the yellow kids team plus the Xcalibre referees that help teach new players strategies and team work at our park. www.facebook.com/media/set/?set=a.2248598305169708&type=1&l=3821d955d9Thank you to everyone who attended our 7th annual Scenario Cup! Events like this are not possible without the players and we appreciate the support in making the day a success. It was a long battle of paintball with our 4 teams! It was amazing to see the type of sportsmanship everyone had to make this competition the best one yet. Yellow team showed up with their own crew of local players with majority under the age of 12! The most fearless bunch we have seen and maxxed their final game in trenches with the only team of the day to get all 5 flags in that field! Blue and Pink team were a lot of familiar faces at Xcalibre that joined together and made 2 solid teams that were neck and neck all day tied in 2nd place before the final games in the round robin! Shout out to our friends and family in these teams who’s team work skills made for some of the most strategic and action packed game play we have seen at these events! We welcome our red team the Devils Rejects as our newest addition to the Xcalibre family! Impressive to see an organized team represent the sport the way these players do on and off the field by helping other players and promoting good sportsmanship to grow the sport we all love. Their skills and team work are undeniable holding 1st place all day! Congratulations to the pink team for getting all points available on their last two games in the round robin that bumped them up to 1st place going into the final Fort game! All other teams became allies to attack for finals and the title of 2018 champions is well deserved for defending the Fort to the end! Xcalibre Paintball added 20 new photos.